South Africa is one of the most fascinating, beautiful and delicious places to visit as a tourist. On a recent visit there, my wife and I were overwhelmed by the friendliness, hospitality and value we found. The food is phenomenal, the wine is world class and the prices are unbelievable for someone with foreign cash. In this article I focus on some of the wines and wineries of the Cape Winelands region. The Winelands are easily reached within a beautiful 90-minute drive from Cape Town, in the southern-most part of the continent of Africa. First, a bit of history. Winemaking in South Africa goes back to its early settlement by the Dutch East India Company 1654. Initially vines were planted and wine produced to treat scurvy among the company’s sailors. Wine production has continued ever since. Through wars, various colonial powers, apartheid and liberation; wine has been an integral part of South African society. 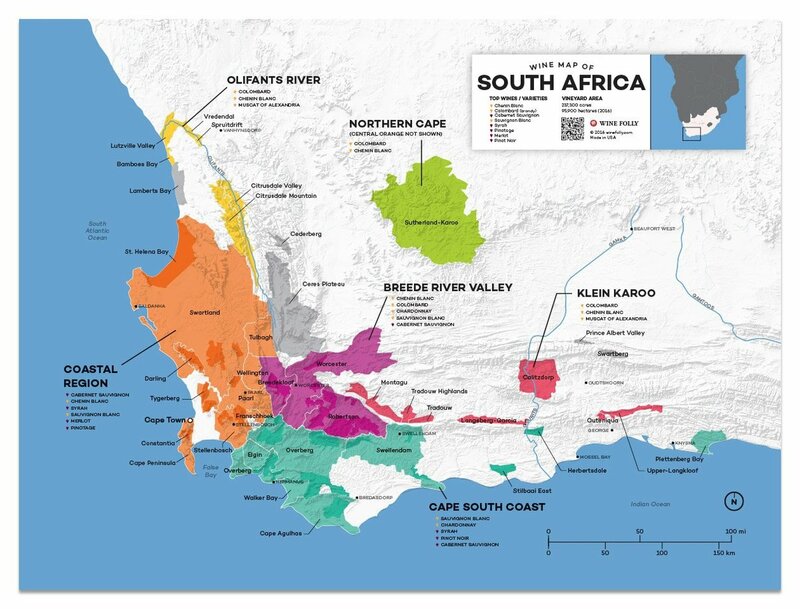 With about 700 wineries, South Africa is the 7th largest producer of wine in the world, right behind Australia. But because it is so far from most wine consumers, it is little visited by other than Africans. What we found was astounding, to say the least. Most wineries are beautiful facilities using ultra-modern equipment. Many have superb restaurants, 5-star hotels and wonderful tasting rooms. And the prices! For a visitor with foreign currency, the bargains are unbelievable. Comparable wines in the rest of the world would cost 2-3 times as much. The biggest surprises were Sauvignon Blanc and Chenin Blanc for whites and Cabernet Sauvignon and Cabernet blends for reds. Also, several Italian varieties stood out. The oldest winery we visited, and one of the oldest in current operation, is Klein Constantia. Founded in 1685, Klein Constantia has gone through its ups and downs. Most famous for producing Vin de Constance, a legendary sweet wine. Napoleon is said to have consumed a bottle every day. Vin de Constance is still produced, as well as many other note-worthy red and white wines. We took a wonderful 4x4 ride through the steep vineyards. When I asked about the various problems growing grapes in South Africa (I was expecting to hear about birds, mold, etc.) I was informed the biggest pest are the baboons. Apparently, they love grapes. Near Stellenbosch, several wineries were memorable. DeMorgenzon produces a large variety of excellent wine. Their Reserve Range is particularly tasty while the DMZ and Maestro lines offer excellent value. Their Chenin Blancs were amazing! Interestingly, classical music is piped out to the vineyards year-round. It seems to keep the vines happy. Delaire Graff Estate is a real jewel, quite literally. Owned by a large diamond company it offers stunning views, a spa, private lodges, jewelry and other luxury products, an art gallery as well as several superb restaurants. During the summer, they host as many as 1000 visitors each day. The state-of-the-art winery produces 480,000 bottles. We tasted 8 of their 17 wines and all were excellent. Most memorable were the 2018 Sauvignon Blanc and 2015 Cabernet Sauvignon Reserve. Well worth a visit. Morgenster is a rather unique place. In addition to the wines produced, Morgenster can lay claim to founding the olive oil industry in South Africa. Every Italian knows there are 2 necessities for the good life: great wine and extra virgin olive oil. There were no olive trees in South Africa in 1992. So, Giulio Bertrand, the Italian born owner of Morgenster imported olive tree starts and began planting and cultivating them. He very generously shared his cuttings and expertise with other like-minded folks. The olive industry in South Africa was born. Today, one can taste Morgenster’s excellent wines as well as their award-winning olive oils in a large and inviting tasting room. Particularly notable are the Italian varietal wines. Also, don’t miss their restaurant 95 at Morgenster. Aptly named Ernie Els Wines, the champion golfer has a beautiful winery in a more remote part of Stellenbosch. Although currently closed for renovations, the winery will reopen in October 2019. Focusing mostly on reds, these are definitely not your typical celebrity, vanity type of wines. All are excellently made and fine values for the quality. 3 bottlings especially stand out: 2017 Big Easy red, 2016 Proprietors Blend and the 2014 Signature. This small town is surrounded by multiple wineries. Don’t miss the hop-on hop-off wine tram which winds its way through vineyards, wineries and restaurants. You can stop and taste or eat and then get back on as many times as you like. There are 3 different routes. All are exciting and fun. Founded in 1700, Vergelegen is a beautiful wine facility. The tasting room, shop and restaurants are located on a road not far from town. The unique, round, multiple level and gravity fed winery is further up the mountainside. With a grand view of the surrounding hills and valleys, the winery presents an excellent introduction to the conservation preserve and leopard sanctuary created by the current owners. The standout wines include 2013 GVB Red and 2012 “V” Cabernet Sauvignon. La Motte dates back to 1695, but the facility is modern, elegant and beautiful. Owned by one of South Africa’s leading industrialist families, the commitment to sustainable farming, art and music is evident everywhere. Their restaurant serves locally grown products. The onsite museum features the work of one of South Africa’s greatest masters, Jacob Hendrick Pierneef. The sculpture garden is a must see and the concert venue often presents programs ranging from opera to rock. Particular standouts include 2016 La Motte Syrah, 2016 Pierneef Syrah Viognier and the astounding 2013 Hanneli R.
While barely scratching the surface of the wine scene in South Africa, it is obvious there is so much history, pride and quality in the bottle and in the touring opportunity. My thanks to Steve Griessel of Betz Family Winery and my cousin Mark Kretschmer for their advice and assistance with winery contacts. M. Stefan has over 30 years’ experience in the wine trade and has traveled extensively throughout the wine producing regions of the world. He can be reached at markken53@gmail.com and appreciates your comments.